One of my goals for 2019 was to read 40 books I already own. I finally had a chance to go through our bookshelves today and pick the 40 books I want to read. By the way, I’m tracking the books I read this year on GoodReads and I’ll be doing a monthly update on what I read and a little review of each book! Have you read any of these books? Which one(s) should I read first? Looking for more? 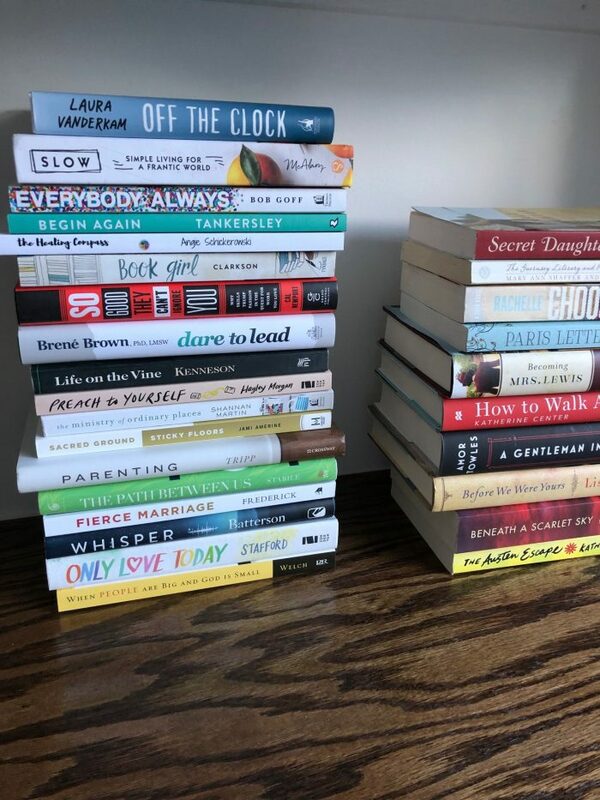 Read more posts about Books & Books Read in 2019. « HOT! Save 10% off your entire shopping trip at Kroger! These are mostly books publishers have sent you? I LOVED Book Girl. It’s a book for adults, not girls. I read it all the way through. I’ve read 3 of her recommendations so far. All were excellent. A few were ones I’ve gotten from publishers, some were ones I got for free from MyReaderRewardsClub.com (Book Girl was one of those! ), and some were ones I bought myself or were given to me as gifts. I’ve read a handful of those books! I just finished Everybody, Always by Bob Goff this week and LOVED it. 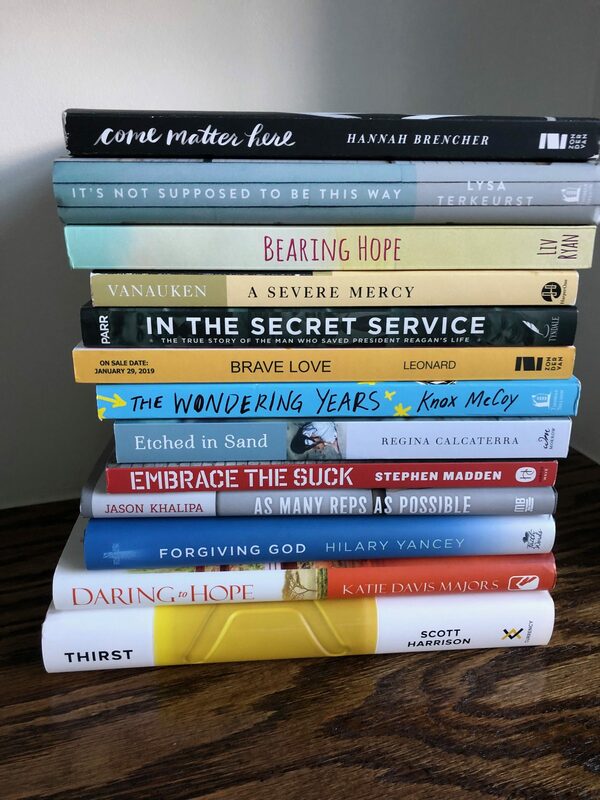 I’ve recently read Parenting by Tripp and Daring to Hope by Katie Davis, and liked those too. For the non-fiction, Before we Were Yours was excellent and so sad, but worth it, and I’ve read the Guernsey Literary and Potato Pie Society and I remember liking it, but it was some time ago, so I can’t really remember that one. I’m sad to admit that I just can’t get into Brene Brown’s books- I’ve tried two, including Dare to Lead- but I always feel like she just goes on and on and on and I lose interest. But everyone is different, that’s what makes the world go round! I’ve read all of Brene’s other books and found them so insightful… but I definitely think she’s not for everyone! And I read The Guernsey Literary and Potato Peel Society a number of years ago but decided to read it again since I watched the movie! I feel the same way about Brene Brown. I loved “Before We were Yours” but it is SO sad, and some parts were painful to read…but the end ties it together well. I had to sit and process it for a while afterward. Thanks so much for letting me know. I’m looking forward to reading it. I couldn’t read beyond the beginning. I’m a foster parent and an adoptive parent and I know enough already. It was a sad story, especially because it was based on true happenings. Very well written, though. I also loved “ Before We Were Yours” . It is sad, but as an adoptive mom, it really touched me. Definitely worth reading. I have several of the same ones in my to be read pile! Daring to Hope was so good! That one really stuck with me. I can’t wait to read your reviews on these. I always get such great book recommendations from you! I’m excited to read that one! I loved How to Walk Away! It was a great story that made you think too. I recently read Kather Center’s next book, Things You Save in a Fire, another great read! Looks like a great stack of books, cant wait to hear what you think about them! That’s so great to hear! I am excited to read it! The Audible version of A Gentleman in Moscow is excellently narrated. I’m picky as an audiobook listener, especially for fiction, but it was really well done and the quality of the narration improved the “reading” experience. I’m a visual reader, and when listening to books I often get impatient because I could read it faster myself and I want to know what comes next. This one was engaging, but I was able to enjoy it in a more relaxed way. The writing is lovely in and of itself, and the narrator really lets that come through, as well as the dry sense of humor. If you like the audio format at all, I definitely recommend it for this one. Thank you so much for this tip!! I read The Guernsey Litersy and Potato Peel Society and loved it! I love historical fiction and this book is based on World War II England life. I hope you find as much enjoyment with this book as I did. It was one I read a number of years ago and I’m re-reading it because I remember it being so good! I’m currently reading Preach to Yourself as I’ve been working on reducing my negative self-talk. Great book! 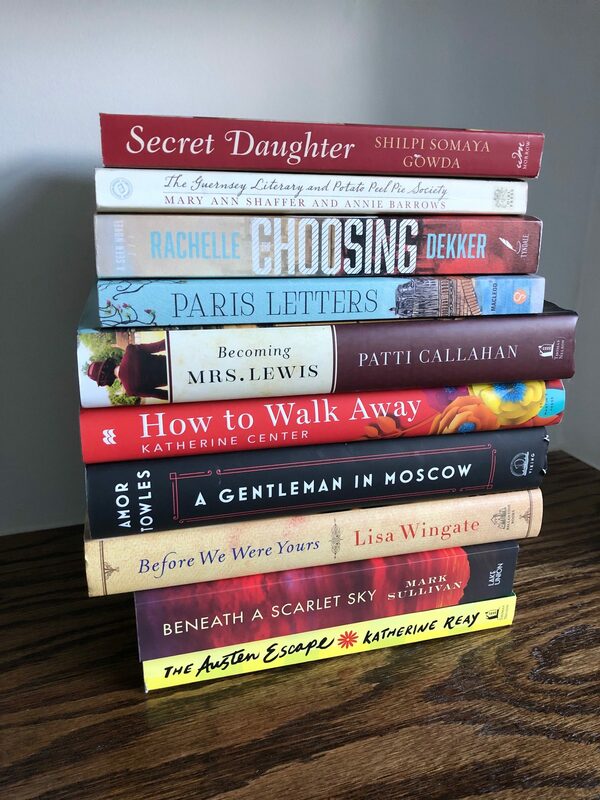 I have a few of the other books on my TBR – Becoming Mrs. Lewis, Everybody Always, and Come Matter Here. I’ll be interested to read your reviews! Oh! Preach to Yourself sounds so good! Can’t wait to read it! Secret Daughter Is a Favorite of Mine! I bought it on a whim a few years ago and could NOT put it down. It’s a book i read at least once a year! It was highly recommended to me by a follower! I’m looking forward to reading it! I’ve read Austen Escape and it was very good! I love all of Katherine Reay’s books (my favorite is still Dear Mr. Knightley)! I agree about Dear Mr Knightley. Also loved Lizzy & Jane. Had a hard time getting into her other titles. Yes, Lizzy and Jane was very good too. The others did take a bit longer for me to get into but I did still like them. You’ll Love Everybody Always if you loved LOVE DOES! Seriously 5 out of 5! Thanks so much for sharing your book reviews! We were given A Severe Mercy at a marriage retreat several years ago. The couple that ran the retreat said that they read the book out loud together, each taking turns reading, which could be pretty meaningful. The summary of it on Amazon is pretty accurate. It is a favorite of mine, but sad. One neat thing that I didn’t realize when I first began it was that the author and C.S. Lewis became friends, and included in the book are a lot of letters they wrote to each other. It was neat to get to know Lewis from that point of view. I’ve heard good things about Becoming Mrs. Lewis, and I’d like to read that one some time. Something to consider, some of the letters towards the end of A Severe Mercy were written around the time Lewis got married to the end of his life. By the way, I really enjoy listening to your podcast! Your one from this past Tuesday – thank you for sharing, it really spoke to my heart. And thank you for your kind words about the podcast! I started Only Love Today just after Christmas. I am using it as a daily small read and enjoying trying to use the take aways each day to get the most out of the book. It looks so good! I’m excited to read it! I enjoyed Gentleman in Moscow, but did it audio. I started it, but didn’t really pay attention and had to start it over. Once I really listened, I enjoyed it. I also liked Beneath the Scarlet sky and Guernsey. Both take place during WWII. Before we were Yours was a tough one, but good. I want to read Becoming Mrs Lewis and Austen Escape. Wow, I did not know that Ted Dekker’s daughter, Rachelle, had published a novel! I’ve been a fan of Ted’s for at least 15 years, so I will definitely have to check her book out. One of my followers recommended it! The Austen Escape was a big disappointment for me. I had to make myself finish reading it, and that doesn’t happen very often. I’m reading Everybody Always after just finishing Love Does and loved/loving them both. I really want to read Brave Love as well this year. Quite a few on your list have caught my eye…. I listened to part of it on the Libby app, but it expired before I could finish it, so I’m excited to finish it! #43 is such a good book. I got it for my bday which is right after Christmas, so I didn’t have much time to read it until recently, The author has an online book study going on now for a few weeks. I am working on Book Girl right now and really enjoying it! A Severe Mercy is a profound book that has stayed with me for over 10 years now. A group of friends and I all read it when we were in our 30s and soon had A Severe Mercy cult. Haha. Not really, but there were people who avoided us at parties because we couldn’t talk about anything else. Hope you find it as deeply moving and that it resonates with you the way it did with all of us. My friend, Jamie, said that I HAD to read it! I really want to read the Lysa TerKeust book, it sounds so good. I just heard her on the Jamie Ivey podcast this morning. Daring to Hope is ssoooo good! I recommend starting there! A Severe Mercy is incredible! I look forward to your thoughts on it! Both my husband and I read it, and we both cried. If you have read anything on the topic of codependency or people pleasing, or you benefited from Keller’s “Counterfeit God’s,” then “When People are Big and God is Small” will be an excellent “counseling session.” I adored it because it felt like someone speaking to specific situations and weaknesses/temptations in my life, all from a Gospel-centered POV. If anyone wants to love God and people more, read it! I have always struggled with Goodreads, I’m not sure why!! I keep a list of books that I have read each year by making an Amazon list with comments about my thoughts on those books. It’s simple enough for me to master! :). However, I was hoping you would also be posting a blog post on your monthly book reviews on your site for us non-Goodreads folks. Yes! Just to clarify: The monthly book review post I mentioned is something I’ll be posting here on the blog. I’m only using GoodReads to track what I read. So you won’t be missing out on anything! It’s just for people who want to see what I’m currently reading and/or who want to see a list of all the books I’ve read. How to Walk Away is SOOO good as is Before we were Yours! I am reading Beneath A Scarket Sky now and it’s a captivating book! I love this WW1 genre and the characters are wonderful! It’s Not Supposed to Be This Way is one of my favorite books ever. I kept renewing it from my library until I couldn’t anymore and had to return it. I took so many notes on it and couldn’t stop talking about it. Lysa is amazing. Excited to see you’re reading Sacred Ground, Sticky Floors by Jami Amerine! A great, grace-filled, funny, and touching read. The Lisa Wingate is very good. I love all of her books! Love love love Goodreads! It has helped me master my “want to read” list, keep track of whether I have read something, and gives me recommendations of titles I would like to read based on my ratings. The only thing I don’t love about it is that it lets people rate books that haven’t even been released yet (and you know that most of them did not actually get a preview copy) so it skews the ratings. And I agree with you about Guernsey – I have read it three times now and it’s always the first book I recommend to any woman who asks. I even had a hard time getting into it the first time because of the format (written in all letters for those who haven’t read it) but it totally won me over. And the movie was good but could in no way go into the same character depth as the book does! YAY! I am so glad that you love Goodreads! My life is so full, adoption of our youngest four! AND I’m an older mom! I don’t have time to read a lot of books and so they have to really grab me, make me laugh make me cry. I highly recommend Sacred Ground, Sticky Floors by Jami Alverine and her first book, Stolen Jesus. Yay! I’m excited to read it! I loved Sacred Ground Sticky Floors! Jami Amerine’s book is raw and real. It is encouraging and affirming. I highly recommend it! Becoming Mrs. Lewis and Daring to Hope we’re both highly enjoyable/thought-provoking reads! I am 3/4 of the way through Parenting and have found it to be excellent….though challenging and convicting. It is one I have slowly read over several months, trying to soak it in and also found myself jotting notes in my journal as I went. Looking forward your reviews! Thanks so much for sharing your thoughts on these books! It’s Not Supposed to be this Way is an excellent read. I read it in December with two girlfriends and we met three times in person to discuss it. Now I am re reading it again with Proverbs 31 Minisries and their on line study. Everyone can relate in some way as we all experience times when we feel this way. I also highly recommend Before We Were Yours- a challenging read as it is so sad but very thought provoking. Read Sacred Ground Sticky Floors!!! Awesome book! Once you start you can’t put it down. It’s like Jami is right there in her southern drawl sharing coffee and stories of her kids and Jesus! Sacred Grounds, Sticky Floors….trust me….this one should be first….. I just put it on my book stack for this week! I LOVED Beneath a Scarlet Sky!!! Enjoy, enjoy, enjoy!!! You can’t go wrong with Sacred Ground, Sticky Floors. Terrific book. Laughter and encouragement and love and Jesus. All the good stuff. Sacred Ground, Sticky Floors gets my vote! Love Jami Ameren. I love everything by Laura Vandekam and definitely recommend “Off the Clock”. She would make a great guest for your podcast! I love this idea, and I’m going to steal it. I have piles of unread books. But, what will you do when you hear about new wonderful books this year?!?! I also second the Laura Vanderkam’s “Off the Clock” as a good one to read first. Loved it! Also, if you enjoyed “Guernsey Literary and Potato Peel Pie Society,” you should check out “The Last Christmas in Paris.” It is another romance told through letters. This one is set during WWI, and I learned a lot about the war that I hadn’t before! Thank you so much for that book suggestion! I loved Sacred Ground Sticky Floors! I have no hesitation in recommending it! I hope you enjoy it as much as I did. Sacred Ground, Sticky Floors!!!! You won’t be sorry!! Such a great book!! “A Gentleman in Moscow” is one of my favorite books. Beautifully written. Thank you so much for the suggestions! And YAY for Chasing Excellence! I’ve read a few of these and highly recommend two. The Guernsey Literary and Potato Oeel Pie Society was a beautiful story. Sacred Ground, Sticky Floors is honest and funny. It’s a great read. I’m excited to read both of those! Beneath a Scarlet Sky and Before We Were Yours were so good!! They both dealt with tough subject matter but the stories were so engaging and well written. Beneath a Scarlet Sky will keep you on the edge of your seat. I loved Before We Were Yours! Keep tissues handy for “Before we were yours”. So good! Yes! You must read Beneath the Scarlet Sky asap! Very good story, and you probably know it’s true. You have got to read Sacred Ground Sticky Floors by Jami Amerine. My absolute favourite book this year!! Funny, so inspirational, well written with a little sense of humour along the way shining a light the trials of daily life. It for sure is a must read. This book is life changing!! The Ministry of Ordinary Places is an amazing book! If you haven’t read her earlier book Falling Free, I recommend that one, too. You will love Jami Amerine’s book, “Sacred Ground Sticky Floors”- it’s such a nourishing and encouraging read! From following you the last few years, I think you will enjoy Parenting. It gets a little redundant at the end, but the first few chapters really shook me. It addresses what our mission REALLY is as parents and also the concept of grace filled parenting. I’m reading Parenting now. So good, insightful, full of wisdom. I LOVED “Everybody Always” audiobook- Bob Goff’s voice made me smile every day that I listened:)! Enjoy! Definitely start with Jami Amerine’s book Sacred Ground, Sticky Floors!! I’ve read a lot of these and I recommend Off the Clock to start with–it will help you feel like you have the leisure to read the rest. I love Daring to Hope. I didn’t know Katharine Reay had a new book out! I’ll have to check my library! I hope you love Guernsey Literary and Potato Peel Pie Society! It’s one of my favorites! The Guernsey Literary Society was so good. I love books written in the format letter writing, its a lost art. I hope you enjoy it as much as I did. You will probably be able to read it in one day under a blanket on a cold day, or on a beach on a hot day. Netflix made a movie based on the book that stayed true to the book! Your girls might enjoy it too. Enjoy it! I read it a number of years ago and am excited to re-read it again since I watched the movie in 2018! I love Shannan Martin’s books! I think I am probably the only person on the planet to say this, but I tried and tried to get into A Gentleman in Moscow but I just couldn’t. I finally gave up. I tried to get into it as well but just couldn’t. Rarely do I not finish a book. I love your list and the variety is great!! The Guernsy Literary is wonderful! I agree with other commenters that the format is different and wonderful! Ed Welch’s book on When People are Big, God is Small is excellent. You will be greatly challenged and benefited from this book. I use it all the time in speaking with young women in my small group. So helpful. The same is true with Tripp’s Parenting book. Happy reading! From your list, I have read The Guernsey Literary and Potato Peel Society, It’s Not Supposed to Be This Way and The Ministry of Ordinary Places. I too loved the letter style of writing in The Guernsey Literary and Potato Peel Society and I really enjoyed the story! I think there is now a movie on Netflix but I haven’t seen it yet. I really enjoyed The Ministry of Ordinary Places. I just love how Shannan Martin and her family are sharing Jesus in unconventional ways and it expanded my thinking on hospitality. I have just recently finished reading It’s Not Supposed to Be This Way and am doing the online Bible study that goes along with this book at Proverbs 31 ministries. It is so helpful (and gives hope) for people whose lives don’t look the way they thought they would look (and I think that affects us all in one way or another throughout our lifetime). I am doing the 2019 Reading Challenge on Goodreads this year too! I have set a goal of 25 and have read 5. I’m hoping to read more than 25 books, but I thought that was a good, doable goal for me to start with. I’m excited to follow what you’re reading. I always enjoy your reviews on what you’ve read. What?? You’ve already read 5 books in 2019?? That’s amazing!!! 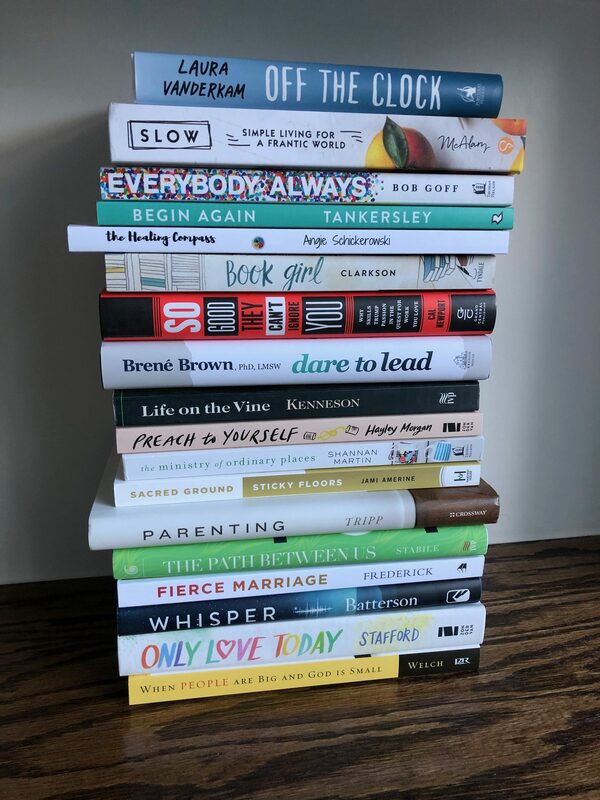 You need to move Parenting by Tripp up on your list (if the #’s equal reading order). It’s a great book filled with so much truth and grace. I wish he would have written it a long time ago! I’ve heard that was a great book and am looking forward to reading it! Thanks! I’m in the empty nest season of life so my evenings are usually free for reading. Parenting by Paul Tripp is amazing. Such good perspective. Can’t wait to check out the other books you picked! I’m excited how many of those are available in Scribd! Thank you. How to walk away was a good book it read well and quickly. Severe Mercy is amazing–it has held up well. Becoming Mrs Lewis was good. Tgurst is on my list and I’ve now added a few otgers–thanks! Sacred Ground Sticky Floors!! Absolutely Amazing. It is a must read! I loved Sacred Ground Sticky Floors! very inspiring with some hilarious stories that will make you laugh out loud!